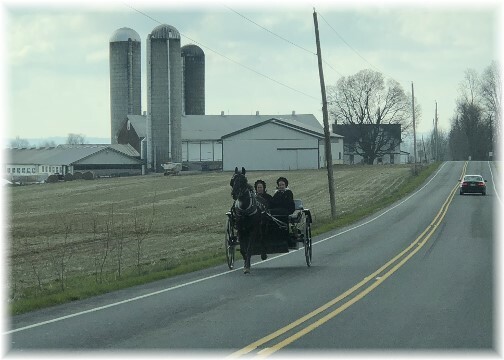 As the weather gets warmer there are more and more open carts such as this one we saw in Lebanon County yesterday morning. Message summary: The Body of Christ truly works as the church “grows and builds itself up in love, as each part does its work”. Let us do our part today in advancing the cause of Christ in the various ways we serve and realize this is best done in a generous spirit of cooperation. We encourage you today to faithfully serve in the manner God has led you; in your local church, your neighborhood, your community, your family and in other areas of service for the Lord. Let us seek to demonstrate the power of cooperation. Listen to our message on your audio player. Yesterday we visited the employees of JK Mechanical, a local company which provides various home and commercial service such as HVAC, solar, electrical and plumbing. Each year they close normal operations and all join together in serving the community in an community service day. 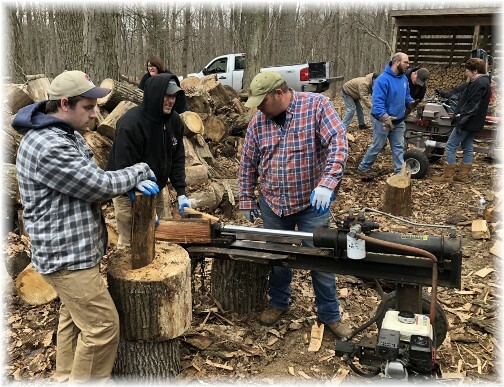 Yesterday the nearly 100 member work force worked together in serving Black Rock Retreat, a Lancaster County Christian camp. 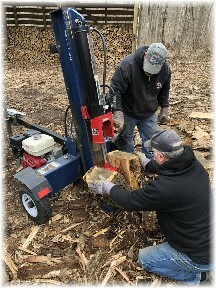 Some used their trade skills in various projects but many did manual work such as spreading mulch, planting and splitting firewood. It was a blessing to observe the employees working together and amazing to see how much can be accomplished in the course of a single day. 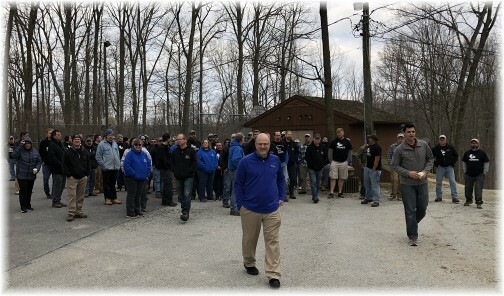 Peter Fiorello, the camp director, had the opportunity to thank the company for their service and explain the many ways the camp is impacting lives. Working together is essential for life to work. Our body parts cooperate with one another to accomplish their roles in making us a healthy being. A failure to cooperate presents a sign of illness or worse. Tradesmen cooperate together in building our homes and this is essential for the whole to work properly. 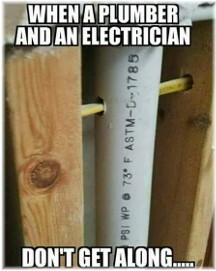 The other day I was visiting with Casey, the plumbing manager at JK, and he showed me the meme to the right which humorously illustrates the consequences of not working together! Davey, a new boy showed up just as the class started. Because he had just one arm, the teacher was a bit nervous, concerned that one of the other children would comment on his handicap and embarrass him. But since there was no opportunity to caution them, she proceeded. As she saw Davey holding his one hand in the air, the awful truth of her actions struck her. The very thing she had feared the children would do, embarrass Davey, she had just done. She stood speechless, embarrassed by her own unintended insensitivity. What a tremendous illustration of the Body of Christ at work in cooperation! Today we merely focus on the final phrase in our second daily text, “as each part does its work”. The Body of Christ truly works as the church “grows and builds itself up in love, as each part does its work”. Let us do our part today in advancing the cause of Christ in the various ways we serve and realize this is best done in a generous spirit of cooperation. We encourage you today to faithfully serve in whatever manner God has led you; in your local church, your neighborhood, your community, your family and in other areas of service for the Lord. Let us experience the blessing of working together and demonstrate the power of cooperation. Daily prayer: Father, we pray for a spirit of cooperation and eagerness to contribute to the needs of the whole body, so that Your Church is built not just with sweat, bricks, and mortar but with love, care, and teamwork. Therefore we seek to work together in cooperation, unity and purpose as we do our part in building each other up in the various natural giftings and learned skills You have given us as we strive for unity in the faith and in our knowledge of the Son of God. 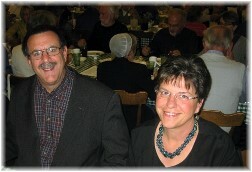 We also want to be on the look-out for opportunities to reach out to those who are not of the household of faith. Through our loving and generous endeavors toward their needs we have more opportunity to share the gospel of Christ with them, helping them not just here and now but reaching them for all eternity. Amen. 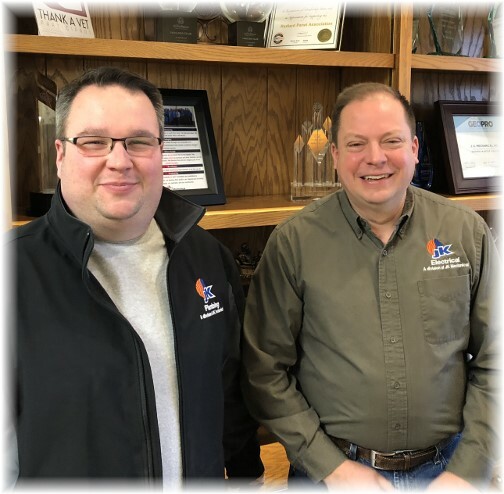 At JK Mechanical Casey, the plumbing manager, and Mike, the electrical manager, get along and work together well! These crews were splitting logs for fireplaces and campfires. After lunch some of the group took a tour of Black Rock Retreat. Our first stop early yesterday morning was in Lebanon County before our long drive down to southern Lancaster County to the Black Rock Retreat to visit the JK Mechanical work team. 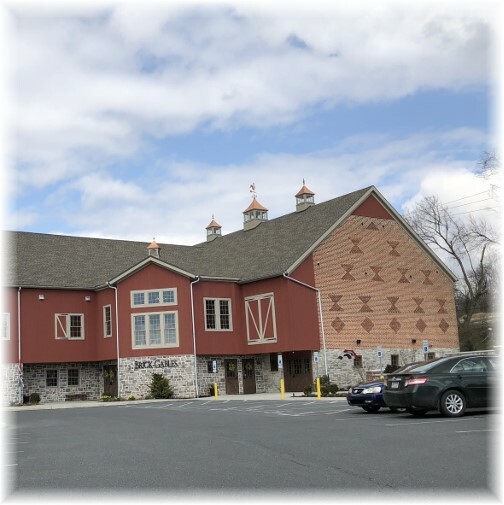 We stopped by to get a cup of coffee at this beautifully restored barn near Lititz PA. Barns like this have become very popular banquet and wedding venues. We got home late yesterday afternoon and since we normally keep our nearly 17 year old cat Dottie in the barn I let her out for some fresh air. She still likes to mosey around. Later I looked out our office window and saw she was in a long stare down with this squirrel she thought she had cornered up on a brace. But after a while the squirrel, of course, managed to escape!